The process of writing is simple. Grab a pen and blank notebook—a laptop if you prefer that tap, tap, tap and the ability to obliterate any adjectives that manage to momentarily violate the sanctity of your sentence—and find a quiet place void of distraction. Maybe you have an office dedicated to maintaining the perfect environment of serenity or maybe you resort to locking the cat, the dog, the kids, and your spouse at the other end of the house and hunkering down in your bedroom with curtains drawn and headphones in. Either way, writing is a solitary endeavor. As is reading. Which is why it’s such a privilege when conferences like AWP role around, giving writers the opportunity to share and receive new ideas and inspiration. The Association of Writers & Writing Programs (AWP) was founded in 1967 and has since grown from supporting thirteen university writing programs to more than five hundred. This year AWP is hosting its annual conference at Los Angeles Convention Center and J.W. Marriott Hotel in California and the Under the Gum Tree team couldn’t be more excited to see the venue so close to our Sacramento home. Taking place from March 30 to April 2, 2016, this year’s AWP conference is expected to see more than 12,000 guests and will feature more than 2,000 authors, editors, teachers, and publishers. For the past four years, Under the Gum Tree has been welcomed at the AWP conference, hosting successful offsite events that help us encourage and support writers—from budding novices to experienced professionals—to share their true stories without shame. While creative nonfiction is still considered by many to be a new development within the nonfiction genre, we love to share our passion for this form of storytelling and we hope you will join us on Friday, April 1. Bonaventure Brewing boasts a beatuiful outdoor venue, perfect for this year's reading. This year Under the Gum Tree has partnered with Fourth Genre—Michigan State University Press’s nonfiction literary journal—to offer this year’s guests a rooftop garden happy hour of telling true stories. Join us at Bonaventure Brewing (Co. 404 S Figueroa St, Los Angeles, California 90071) from 6:00 to 7:30 p.m. on Friday, April 1, 2016. The event is free and all are welcome to join us, so grab yourself a drink from the cash bar and then cozy up under the stars to hear readings from Under the Gum Tree contributors Penny Guisinger, Ira Sukrungruang, Camille Griep, and James M. Chesbro and Fourth Genre contributors Kathryn Winograd, TaraShea Nesbit, Kate Carroll de Gutes, and Katherine E. Standefer. To learn more about the contributors, please find their bios below. For any questions regarding the event, give us a shout out on Twitter or Instagram at @undergumtree! Find us at booth 621 all weekend! Penny Guisinger lives and writes on the easternmost tip of the United States. Her work has appeared or is forthcoming in Fourth Genre, Solstice Literary Magazine, and About Place Journal, and her reviews appear regularly in The Quoddy Tides and The Review Review. Her essay “Coming Out” was named as a finalist in the 2013 Fourth Genre essay contest, and one called “Provincetown” was awarded an editor’s choice award from Solstice. She is the founding organizer of Iota: The Conference of Short Prose. Penny is a graduate of the Stonecoast MFA program at the University of Southern Maine. Her creative nonfiction essay “Six-Point Win” was featured in Issue 9 of Under the Gum Tree. Ira Sukrungruang is the author of The Melting Season, Southside Buddhist, Talk Thai, and In Thailand It Is Night. He teaches in the MFA program at University of Florida. Camille Griep is the author of the novel Letters to Zell, an epistolary fairy tale and her newest book, New Charity Blues, will be available on April 12, 2016. She is the managing editor of Easy Street and a senior editor at The Lascaux Review. Her shorter works have appeared in journals such as Cartridge Lit, Synaesthesia, and The First Line. She lives and writes near Seattle. Her creative nonfiction essay "Roads, Lost" was featured in Issue 16 of Under the Gum Tree. James M. Chesbro has had work featured in The Writer's Chronicle, Brain, Child Magazine, The Huffington Post, Connecticut Review, The Good Men Project, and Spiritus, among others. His essays have been listed as notable selections in The Best American Sports Writing 2014 and The Best American Essays 2012, 2014, 2015. He holds an MFA from Fairfield University where he is an adjunct professor of English. Kathryn Winograd is the author of Phantom Canyon: Essays of Reclamation, a finalist in the ForeWord Reviews 2014 INDIEFAB Book of the Year Awards, and Air Into Breath, winner of the Colorado Book Award in Poetry. She’s recently been chosen by AWP as its Member in the Spotlight and serves as faculty for Regis University’s Mile High MFA program and Arapahoe Community College. TaraShea Nesbit is the author of The Wives of Los Alamos, which was a New York Times Editors' Choice, a finalist for the PEN/Bingham Prize and the recipient of two New Mexico-Arizona Book Awards. Her prose has been featured in The Los Angeles Review of Books, The Guardian, The Collagist, Quarterly West, The Iowa Review and elsewhere. She teaches in the creative writing program at Miami University. Kate Carroll de Gutes is the author of Objects In Mirror Are Closer Than They Appear, a finalist for the Oregon Book Award and the Lambda Literary Award. Kate has a Master of Fine Arts in Creative Writing from the Rainier Writing Workshop at Pacific Lutheran University. That sounds really fancy and impressive, doesn't it? Really it means she'll have student loans until she is 72 years old and that all her liberal arts education makes her fascinating at dinner parties. You can learn more about Kate and read her critically acclaimed blog, “The Authenticity Experiment,” at www.katecarrolldegutes.com. Katherine E. Standefer writes about the body, consent, and medical technology from Tucson. Winner of the 2015 Iowa Review Award in Creative Nonfiction, her most recent work appears in Fourth Genre, The Iowa Review, The Colorado Review, Cutbank, and The Indiana Review, and has been nominated for a Pushcart Prize. She has an MFA in Creative Nonfiction from The University of Arizona, where she currently teaches in a pilot narrative medicine program at UA's College of Medicine. Follow her @girlmakesfire. Written by Faith Lewis, Under the Gum Tree intern. Have you heard the news? Under the Gum Tree turned four years old in October! That's four years and seventeen issues of telling stories without shame. To celebrate the publication of Issue 17 that was released in October 2015, we invited our contributors to join us to read their featured piece. Thanks to the miracle of technology, we welcomed three writers from around the country: Mark Liebenow, Abi Bechtel, and Benjamin Winterhalter. It is always exciting to hear writers reading their own work, so if you missed this installment of Gum Tree Live, watch it below or follow this link to see it on YouTube. Happy listening! We are always excited to hear from our incredible writers and we're sure you'll have as much fun with Gum Tree Live as we did! With the upcoming release of The Best American Essays 2015, we are proud to announce that two essays previously featured in Under the Gum Tree have been selected as notable essays by the anthology. “Ashley and I,” by Ryan Mitchell was featured in the April 2014 issue and “Attempted Homicide,” by Brigitte Bowers appeared in the October 2014 issue. The Best American Essays is an annual anthology that strives to showcase the finest nonfiction writing from across the country. A team of editors select exemplary work published through the year in various magazines, journals, and online publications. These essays are then narrowed down further by a guest editor, selected each year for their renowned expertise in the field. This method of essay selection allows for a great variety of writing styles and topics to be included in the anthology each year, making it a unique blend of the personal experiences that make America. Mitchell’s story delves in to the emotions associated with a gradual realization that people you care about are not always who you think they are. She examines the notion that we supplement our understanding of people be by filling in the gaps of what we don’t know about them with what we would like to be true. This idea has amazing ramifications as she tells the reader about the years she spent communicating with an online pen pal. These idealizations and expectations slowly being to slip away when she finally meets this man—and his girlfriend—during a family vacation. "Ashley and I" brings into question the role of virtual communication in a world that is constantly becoming more digital. The piece is crafted in such a way that as readers see the events unfolding, they can sense the tantalizing and unwritten details. It is impossible to read "Ashley and I" without drawing to mind some similar personal experience when a potential friend—either someone met online or otherwise—has fallen utterly short of our lofty expectations. Mitchell teaches English at Lycée Français de la Nouvelle Orléans. Other pieces of her work have appeared in publications including Otis Nebula and Cannibal, among others. Bowers’ piece spans the author’s nine years in an abusive relationship and touches upon the tangled motives and events that held the fractured pieces of her life to his for so long. "Attempted Homicide" begins rather bluntly with Bower confiding to the reader that she had considered killing Dan McDonald before explaining why or who the man was. Bower manages to navigate a challenging and often-avoided subject with her direct and honest perspective. Without saying so, Bowers speaks to the idea that we must be our own advocate, especially when it's the most difficult thing to do. Though in the end she offers no solution to the situation and only a mediocre explanation that doesn’t satisfy the questions she asks herself, the reader is left with the idea that there is no single definition of strength. Instead, it is something we must find inside if we want to see a lasting change in our life. Bowers holds an MFA in creative nonfiction from California State University, Fresno. She is a lecturer in the Merritt Writing Program at UC Merced and a columnist for the Merced Sun-Star. 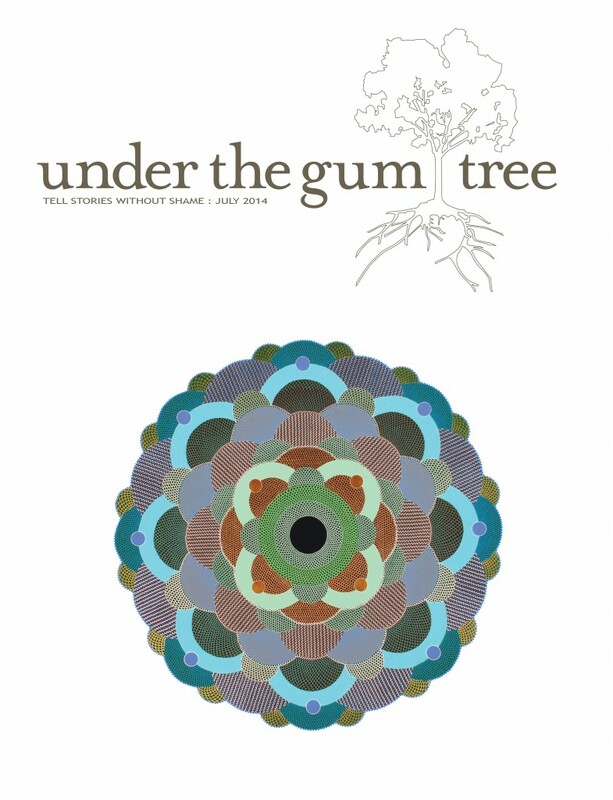 Both back issues of Under the Gum Tree can be purchased in digital format from our website here, or hard format from our MagCloud store here. The Best American Essays 2015 goes on sale October 8. We like to stay in touch with our contributors and celebrate recent accomplishments, like awards, book deals, and solo art shows. Here's the latest news from several of our previous contributors. Past contributor, Samuel Autman, has been chosen as the first place winner in the SLS-Disquiet 2015 Literary Contest in the nonfiction category for his essay, "Invisible Nails." Samuel has an MFA in nonfiction form Columbia University and is part of the creative writing faculty at DePauw University in Greencastle, Indiana, where he teaches journalism and creative writing. His work has appeared in Brevity, Postcard Memoirs, I'm Black and I Travel, The Q Review, and RESILIENCE. Samuel's piece, "The Tongues of Angels" appears in our seventh issue. His award-winning piece, "Invisible Nails" was selected from more than 1,000 entries. Timothy Kenny, a former newspaperman, non-profit foundation executive and college journalism professor, has reported widely from Central and Eastern Europe, including Croatia and Bosnia during the early stages of the Balkan conflicts in the 1990s. Timothy has also taught journalism as a Fulbright scholar at the University of Bucharest. We had the honor of publishing his piece “Turning Sixty-Six and Six in Umbria” in our sixth issue, and most recently that same essay has been published in a book of his collected essays, Far Country: Stories from Abroad and Other Places. His book is set for release this month; for preordering, you can find it available here. Penny Guisinger, published in our ninth issue, lives and writes on the easternmost tip of the United States. She is the founding organizer of Iota: The Conference of Short Prose, and herwork has appeared in Fourth Genre, Solstice Literary Magazine, and About Place Journal, and her reviews appear regularly in The Quoddy Tides and The Review Review. Penny has recently signed her first-ever book contract with Vine Leaves Press for her collection of micro-essays called Postcards From Here, which will be published in spring 2016. The manuscript was a finalist in the annual Vine Leaves Press Vignette Collection Contest, and was chosen for publication. 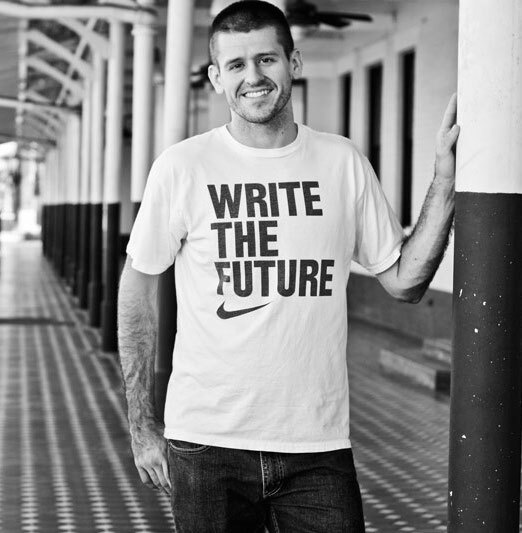 Chris Wiewiora, published in our fourth issue, live in Ames, Iowa where he managed Flyway: Journal of Writing and Environment and where he earned his MFA in Creative Writing and Environment at Iowa State University. He serves on the editorial board of BULL: Men’s Fiction and an assistant editor for About Place–the journal of the Black Earth Institute. Currently, Chris has had an essay republished in Story Magazine and has also just signed a contract to have an essay reprinted in the fourteenth edition of The Norton Reader of Nonfictioncoming out in January 2016. Jane Garrett Ryder, contributing artist form our tenth issue, was born and raised in Illinois. In 2005 she received her BFA from Bradley University and went on to get her MFA at Northern Illinois University. Jane describes her paintings as a right-brained approached to observing, dissecting and recording the objective subject matter found in lakes, rivers, prairies and forests of south central Iowa. Jane has two upcoming solo shows: at the Silverwood Gallery in St. Anthony Minnesota in August, and at the Wakely Gallery at Illinois Weslyan University in January 2016. Under the Gum Tree is proud to announce our third-to-date appearance at AWP; Association of Writers & Writing Programs! We first participated three conferences ago for AWP13 in Boston. With just six issues under our belt as an independent, reader-supported magazine, we were relatively young magazine years. Seattle '14 was our second time participating and definitely more streamlined than before. No longer our first rodeo; we knew what we were doing! We even hosted our first off-site event, a live reading in one of Seattle's well-visited coffee shops, showcasing twelve of our contributing writers reading from their pieces. The event was a success, drawing in 60+ people—just look at that comfortable crowd! Now we—still completely reader-supported and independent, but with fourteen issues (and a fifteenth on its way! )—can say we're seasoned; that we aren't the new kids on the block. With each subsequent year we learn more, take away more, and thus have more fuel for our unrelenting passion for creative nonfiction. We are off to Minneapolis in a few weeks for our third time as an exhibitor at AWP (we will be at table 1892 for those of you attending who want to say hi), and our second time hosting an off-site live reading—only this time there will be food and libations available! Can you think of a better way to kickstart a Friday night? Neither can we. Mason's Restaurant Barre is kindly allowing us to host our lineup of seven readers at their space in downtown Minneapolis, just walking distance from where the book fair will be held at the convention center. Our reading will take place at 6 p.m., so mosey on over to Mason's, grab your happy hour drink of choice, relax while our readers regale you with their true stories, all before heading out to make material for new true stories of your own. If you want to keep track of the event for your conference schedule on the AWP's list of off-site events, follow this link, or you can follow here for our Facebook event. The competition for this prize is fierce, and the UTGT editors would like to recognize the accomplishment of these four writers regardless of the outcome of this nomination. We look for stories that explore the truth and meaning in our life experiences with a vulnerability that rejects the shame that society often thrusts upon us, and we have been honored by the stories of these writers who fearlessly embody our motto: Tell stories without shame. To read these stories, purchase a digital copy of the magazine here, or purchase a print copy here. So, you missed the online anniversary reading which happened live from our humble studio last week. Well don't sweat it, reader! You can still watch every minute of it below. We had fun, as did our readers, and you can to, just click play or follow this link to view the video on YouTube. We were pleased to hear from Mary Collins, Lesley Howard, J.J. Anselmi, Kate Washington, Brigitte Bowers, Jonny Blevins and Wendy Williams. Who woulda' known Mary has such a beautiful accent? Or that Brigitte could evoke so much laughter? These details are the tiny nuances we get to witness and share when experiencing events such as live readings. They bring us together, and especially in a technologically-driven age, keep us human and connected. Apart from the anniversary reading, we're still honoring our promise to waive the submission fee for the entire month of October. But you better hurry and submit before that window ends on the 31st and before the winter deadline of November 1 approaches! One last thing we want you to keep your eyes open for are our Meet the Artist interviews we started sharing this week. If you follow us on any of our social media platforms, facebook, twitter, tumblr, instagram, then you will catch visual snippets of the artwork inside this issue and a quick one-question Q&A from the respective artist. So far Anna Ladd and Allen Forest have given us some compelling responses. To see one of ours and Allen's sample interviews click here. As for Meet the Author interviews, we'll have a new one to share within the coming week! "Put it off as long as you can. Wait until you have finished your last dinner and your roommate has left for a last walk, then look through the bedroom doorway at your suitcase and tell yourself that you have to start. Do not go into the bedroom. Go into the living room instead. Dig through the contents of your suitcase, which is already half full of souvenirs and books. Notice that there is not much left for you to do. A handful of shirts, a few pairs of shorts, a toothbrush, a sweater—this is all that holds you in this apartment. Stuff these things into your suitcase and realize that now nothing holds you here—nothing but your roommate and a few unopened beers in the fridge. Consider how neatly your life fits into a bag. Leave the suitcase open. Pretend this means something." To read Kindig's full story and those from Lucy Black, Robert Freedman, Rachel Lowrance, Justine Ickes, Janna Marlies Maron, and Chelsea Schott, purchase your summer issue here. We hope you take as much pleasure in the stories and artwork as we do. Here at Under the Gum Tree, we're very lucky to be supported by a small staff of amazing editors, designers and interns--all who volunteer their time to make the magazine what it is. So I wanted to take a moment and acknowledge their hard work, and let you know about a few recent changes. If you check out our masthead, you'll see that we have two assistant editors, Kathryn DeJarnette and Becca Litman, who joined us about six months ago and have been a HUGE help with our submissions queue. Bringing them on board also meant that Robin Martin, my good friend and colleague, took on the role of senior editor. This year also brought a bittersweet transition when I said goodbye to the lovely and talented Natana Prudhomme, who launched the magazine with me back in August 2011 and who designed our logo and page layout. I can't tell you how lucky I was to find Natana (and would you believe it was all thanks to a Craigslist ad?) --seriously, Under the Gum Tree would not be the gorgeous magazine that it is without Natana. When we started working together, all I had was the title and an idea and Natana executed that idea more beautifully than I could have imagined. As sad as I was to see Natana go, I was so honored to have worked with her for two years and am excited to see her pursuing her goals as an artist. In addition to the volunteer staff, I have had the privilege of mentoring a very talented young lady who has been an intern with Under the Gum Tree for the past two years, Elizabeth Kroll. You may recognize Elizabeth's name from our e-newsletter, which she has been managing as part of her role as editorial intern. With Elizabeth on board, we have done many things that we wouldn't have been able to do otherwise. Things like regular blog posts, Facebook and Twitter updates, Meet the Author interviews, and more. Elizabeth's internship has been with us during her junior and senior years of high school. That means she's about to graduate and leave us for college life. In the fall she'll be headed off to Sarah Lawrence College in New York, where she plans to study fiction writing and psychology to explore the connection between storytelling and the subconscious. Hello and thank you! for reading this blurb. My name is Katie Walker and I’m abuzz with excitement at the opportunity of interning with Under the Gum Tree. Last fall the door to UTGT was opened to me by none other than Elizabeth Kroll. It was during a poetry writing course at Sac State that I had the pleasure of sitting one seat ahead of Elizabeth and consequently hearing of UTGT from her. I myself am passionate about the writing and retelling of stories as a means of self-preservation and expression, and I aim to make a career out of fostering storytelling like all those hard at work for UTGT. I look forward to the coming months of helping connect you with news and updates for our amazing publication! Well--you can tell we've had a lot of changes around here recently. But you know what comes with change: growth. We have seen some of our staff leave us and move on to bigger and better things as part of their individual growth; we have seen new people join our staff as part of our growth as a publication and as a community. As a reader, you are part of that community and a part of that growth. In a few short months we'll be celebrating Under the Gum Tree's three-year anniversary and I hope you're as excited as we are to see what changes come as a result of our continued growth in the years to come. Running a literary magazine is often a labor of love. No one I know ever does it to get rich, and no one I know gets rich doing it. Even writers and artists submit to literary magazines as a labor of love, because they want to gain some exposure for their work no matter what--no matter that most of the time they don't get paid for that work. It's always been one of my goals to some day pay Under the Gum Tree contributors and staff. We are coming up on our third anniversary this year (in October) and, while that is still a goal, we are sadly still a ways away from reaching that goal. So how does UTGT make it? Currently our revenue from subscribers and submissions (yes, we do charge the nominal and controversial submission fee) covers our costs of producing the magazine (not including staff time) and we break even. At least we're not losing money, right? But until our subscriptions and submissions increase enough to put us in the black I have been trying to get creative with other ways to generate revenue. Tugboat Yards helps digital publishers find their true fans, establish new revenue streams, and foster meaningful relationships with their supporters. Read more about the Tugboat Yards mission on their about page. With Tugboat Yards, not only can Under the Gum Tree continue to sell subscriptions and back issues, but also we can offer sponsorships and other options--and smaller price points--for people who want to support us. This means that maybe a subscription is a bit too much for your wallet right now, but you really like what Under the Gum Tree is all about--no worries, you can support us with a $5 tip and we'll send you a sticker or a button. How cool is that? Likewise, if you're a fellow publisher or are part of a literary organization whose mission and vision is complementary to the UTGT mission, then we can partner on an issue with one of our sponsorship offers. You can sponsor the issue as a publisher, which means you get to write a two-page publisher's letter, you get your logo on the back cover of the magazine, you get your name listed as publisher on the masthead, and you get a one-year digital+print subscription. You can also sponsor an issue as an editor-at-large, which is ideal of other publishers, small presses or agencies who work with writers of nonfiction that they'd like to see featured in a magazine like UTGT. You get to partner with us on one issue to help decide on some of the content, you get your name listed on the masthead as editor-at-large and you get a 1-year digital+print subscription. Under the Gum Tree is still a fledgling magazine, working hard to find its way in the world and Tugboat Yards is helping us to do that. We're experimenting with the Tugboat offers and I welcome both support and feedback. If there's something you'd like to see us offer, please don't hesitate to drop me an email. Check out Under the Gum Tree's Tugboat page and please share with your social networks, family and friends. And, as always, thank you for your support--it is what makes it possible for Under the Gum Tree to continue to publish visual art and nonfiction stories told without shame. This is the time of year when my editor’s letter for Under the Gum Tree's newest issue reflects on our collective experience at the annual conference put on by the Association of Writers and Writing Programs (AWP). Is it cliché because every one else who attended does the same thing? (And this year there were 13,000 of us in Seattle.) Maybe. But it’s also the perfect milestone for a little indie lit mag like Under the Gum Tree to measure its progress. Last year’s AWP conference in Boston was our first time as a vendor at the book fair. We had six issues behind us and our table was at the end of the last row in the corner of the exhibition hall. Probably not the best spot for organic foot traffic. Also? I definitely tried to do too much: sell subscriptions, sell back issues, get people to sign up for our email list, connect with writers interested in submitting. This year I changed my strategy. I had two main goals: get people to sign up for our email list by giving away buttons and host a reading with previous contributors from all over the world. Check and check. If you were there and you missed our buttons, they were a huge hit. (Not to worry, you can still get one if you’re interested in supporting us in a small way.) If you were there and missed our reading, that was also a huge hit. We hosted a fast and furious nonfiction reading where twelve of our previous contributors read five minutes of their work, and no less than sixty people came out to Caffe Ladro on Pine Street (the most perfect spot for the event, just one block over from the convention center). Here's a video recording of the reading. Readers (in order of appearance) are Renee D'Aoust, Sheryl St. Germain, Susan Pope, Georgann Turner, Jacqueline Doyle, David Gardner, Jacqueline Alnes, Linda Silver, Mare Biddle, Mandy Len, Erin Ashenhurst and Robert D. Vivian. Connecting with other journals of creative nonfiction. One of the great things about a conference like AWP is that it's a rare occasion for all of these people to be in the same place at the same time, and it's a great opportunity to connect with peers--folks who are doing similar things--and learn from each other. We had the chance to do just that with other journals that also publish creative nonfiction such as Brevity, River Teeth, Fourth Genre and Creative Nonfiction. When I put out a call to our contributors to find out who would be at AWP, I got emails back from no less than twenty-five people. Of those twenty-five, twelve were featured readers at Under the Gum Tree's first ever AWP reading (and, as I mentioned, you can see we had quite the crowd). But I still got to connect with at least twenty-five previous contributors who were all in Seattle for the conference. Some of them stopped by our table to introduce themselves and others came to the reading. And each time I met one of them, I got to personally hear their reaction to the magazine and what we are doing--they thank me for publishing their work, when really I should be thanking them (and I do!) for letting us share their work. Connecting with folks who we follow online. We have regular interactions online via Facebook and Twitter, mostly, with folks like Ruminate Magazine and Meghan Ward, both of whom we got to meet at AWP (and Meghan even gave us a shout out in her own #AWP14 wrap-up blog post). When you've only known people online and you have a chance to meet them face-to-face, it completely changes the relationship and brings it to a new, deeper, more memorable level. I got to put hard copies of Under the Gum Tree into the hands of people who will now hopefully remember the magazine because they remember meeting me. Connecting with nonfiction book publishers. Connecting with movers and shakers in the nonfiction genre. Not only did we have a chance to connect with other journals, previous contributors, our online friends, and nonfiction book publishers, but also we connected with bigger names in the nonfiction genre like Judith Kitchen, Sheryl St. Germain (also a previous contributor), Dinah Lenny, Brenda Miller (another previous contributor), and Ira Sukrungruang. During a rare slow moment while I was working our table, a woman stopped, picked up a copy of Under the Gum Tree, and started flipping through the pages. Her name badge was at my eye level and I recognized it right away. "Sue Silverman," I said, "I just read your book." The book is Fearless Confessions: A Writer's Guide to Memoir, which I had just finished a few weeks earlier. We chatted for a few minutes about nonfiction and the power of sharing personal stories. She told me that I was doing important work and before she continued on her way she asked if she could give me a hug. Where else can all this happen except at AWP? A better question for us is: When else can all this happen except after three years and ten issues? Our story wouldn’t be what it is without you—readers and writers who believe in what we are doing, who support us in our work of finding and sharing stories. Thank you for that. We intend to continue doing that important work. Here's to the Last Two Years, and Beyond. As you may know Under the Gum Tree had its second anniversary reading party this past Friday, and we are happy to report that it went off without a hitch. We had a full house at Bows and Arrows (who we are so grateful to for letting us host there), and had people from all over the world tuning in online (even someone from India joined us). Not only were we overwhelmed by the turn out, but also we were overwhelmed by the power of the stories shared by our readers. This event wouldn't have happened without them and we feel honored brining you their moving tales, which each one shared without shame. If you couldn't join us Friday night you also missed the great conversation on twitter. Check out the tag #gumtreelive to catch up. To everyone who joined us, we would like to say thank you and we hope you enjoyed it. And to everyone who has been with us, during any part of these two wonderful years, we are so grateful for all of you, and we can't wait to share the years to come with you. Jeff Goins, from Nashville, TN, is a full-time blogger, speaker, and author. He is the former Communications Director of Adventures in Missions, an international nonprofit Organization. Originally from Chicago, Jeff graduated from Illinois College and spend the next year on the road with a band. Since studying abroad in Spain, he has always had a passion for travel, missions, and making a difference in the world. His first book, Wrecked: When a Broken World Slams into Your Comfortable Life, addresses the issue of how we live purposed-filled lives by serving the needs of others. His blog, goinswriter.com, is one of the fastest-growing blogs on the web and a well-respected resource for writers, artists and entrepreneurs. His work has been published online and offline in a variety of publications, including RELEVANT Magazine, copyblogger.com, and zenhabits.net. Heather Scott Partington, from Sacramento, CA, was raised in the Central Valley and earned a BA in English Literature from UC Davis. There, she discovered her love for Norse myth and a good kenning. A classically trained ballet dancer, she apprenticed with Sacramento Ballet and was a member of Sacramento's CORE Dance Collective. Heather is a high school English teacher, wife, and mom to two monkeys, Addie and Hank. Lee Olsen, from Bellingham, WA, grew up in northern Utah where he learned the alto saxophone and the guitar, along with an appreciation for backpacking, cycling, traveling, storytelling, and literature. He studied aviation and English at Utah State University before interning at Utah State University Press, teaching ESL at King Mongkut’s University of Technology, Thonburi, Thailand, and beginning an English master’s degree in 2012 at Western Washington University, Bellingham, Washington. Elaine Gale, from Sacramento, CA, is a writer, journalist, and professor. She was a religion reporter for the Los Angeles Times and an advice columnist and pop culture reporter for the Star Tribune in Minneapolis. She was an adjunct professor of Journalism at University of Arizona in Tucson. She worked for the Boston Phoenix, the Utne Reader and writes for national magazines, including Entertainment Weekly, Good Housekeeping, W, Variety, Stuff Magazine, and Cosmopolitan. Currently, she is an Associate Professor of Communication Studies and Journalism at California State University, Sacramento and the Writing Center Director for Antioch University’s PhD Program in Leadership and Change. She holds a doctorate in Human Communication from University of Denver, an MFA in Creative Writing from Antioch University, Los Angeles, and a BA in English and Religion from Boston University. She has also studied at Oxford University, St. Catherine’s College, in England and Grenoble University in Grenoble, France. Sheryl St. Germain, from Pittsburgh, PA, has published ten books of poetry and prose for which she has won numerous awards. Her most recent book is Navigating Disaster: 16 Essays of Love and a Poem of Despair. She currently directs the MFA Creative Writing Program at Chatham University in Pittsburg, PA.
Elison Alcovendaz, from Sacramento, CA, holds an MA in Creative Writing from California State University, Sacramento, where he won five Bazzanella Literary Awards in fiction, creative nonfiction, and critical analysis. His work has appeared in Gargoyle, Calliope, in parenthesis, and other publications. He just finished his first novel, The Jack of Heartland, and is currently working on a collection of interrelated short stories about what it means to be a neighbor. Penny Guisinger, from Trescott, ME, lives and writes on the easternmost tip of the United States. Her work has appeared or is forthcoming in Fourth Genre, Solstice Literary Magazine, and About Place Journal, and her reviews appear regularly in The Quoddy Tides and The Review Review. Her essay “Coming Out” was named as a finalist in the 2013 Fourth Genre essay contest, and one called “Provincetown” was awarded as editor’s choice award from Solstice. She is the founding organizer of Iota: The Conference of Short Prose. Penny is a graduate of the Stonecoast MFA program at the university of Southern Maine. Deborah Meltvedt, from Sacramento, CA, is a medical science teacher and program director at a small, public high school in Sacramento. She was born and raised in the Central Valley and is learning to return to her roots through memories of Fresno heat and growing up in the 1970s. She loved to blend health education and creative writing, not only in her own pieces, but also in the imaginations of her high school students. In between writing stories and lesson plans, Deborah loves running, traveling and spending time with her journalist husband, Rick Kushman. We're so excited that these contributors could join us. It's one thing to read the stories in print, but hearing the writer read his or her story brings a whole new dimension to the piece and we know you don't want to miss this live event! Quick reminder: Don't forget to set up your Google+ page, and like ours so you can join us for the event, and watch for updates through Facebook and Twitter. We'll see you on Friday, 11/15 at 6 p.m. PST. Only a month left until our anniversary reading and we can hardly wait. If you haven't heard, we're hosting an online reading via Google+ hangout. The live broadcast is set for November 15th at 6 p.m. PST, and because it's online anyone can join and help us celebrate. The evening will feature both readers from here in Sacramento and all over the country. We'll also be hosting a local event here in Sacramento at Bows and Arrows, where we will be live streaming the broadcast for anyone who wants to join us in person. Now as far as we know nothing like this has ever been attempted by a literary magazine, especially one as small as ours, but we just didn't feel like a private reading would do everyone's hard work justice. We wanted to involve as many people as possible, whether you're a reader, a writer, or a friend and fan of creative nonfiction. We are celebrating your commitment, just as much as ours. As we said, we're pretty sure this has never been done before, so we weren't expecting it to be easy. We had to find readers, and work out schedules, (since there is a three-hour time difference with a few readers); we had to set up a new Google+ page to host the hangout, and then figure out how all that worked; we had camera issues, and sound issues, and little kinks that had to be worked out, but we did it all with the utmost excitement, because we knew it will be worth it when we get to share it with you. You're might be wondering who the readers are at this point, and we will share them with you...just not yet. We like a little suspense. All we'll say for now is that there are nine of readers, and four of them are local to Sacramento; we'll leave the rest up to your imagination. If you have any guesses let us know either on Facebook, Google+, or Twitter, and make sure you're following us so you don't miss any of the exciting updates. In the meantime, save the date for Friday, 11/15 at 6 p.m. PST. We'll see you there -- virtually! 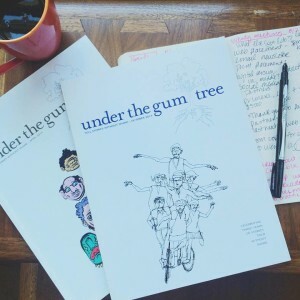 Exciting news: Under The Gum Tree has paired up with local, Sacramento business, Flywheel, and print copies of the magazine are now available in store. Flywheel is a store in the downtown plaza, run by the Arts and Business Council of Sacramento. Their mission is "to promote partnerships between business community and arts organizations in order to enhance the economy and enrich the quality of life in the Sacramento region." They feature local artists, writers, and designers, as well as offering classes and panels at the store. Check them out at the Downtown Plaza #1045, or through their facebook page. We are so excited to be a part of this great community, and to be represented among such amazing local talent. As our first retail location we have high hopes for the partnership, and the sale of the magazine. We would love to hear what you have to think about the store, and if you're just as excited as we are. As a digital publication Under The Gum Tree has the possibility of being enjoyed anywhere in the world. We have subscribers from Switzerland, Romania, Portugal and many other countries, but we didn't realize how far our magazine had gone, until we received this email from one of our recent contributors, Renée D'Aoust. This photo is very low quality, but I asked my middle brother if he would take your fantastic UNDER THE GUM TREE down to Antarctica with him. Thought you might get a kick out of this. Here's the evidence your wonderful journal has made it down to the ICE! Thanks so much for all you do on behalf of words and writers of words. Under The Gum Tree has made it farther than we ever imagined it would, but that is the great thing about publishing: You never know where you'll end up! AWP 2013 - We're going, are you? With less than a month to go, this year's AWP conference is approaching fast. For those of you who don't know what AWP is, it is the largest academic writing conference in the United States with over 10,000 attendees last year alone. There will be feature presenters such as Seamus Heaney, author of Human Chain and winner of the Nobel Prize in Literature, as well as panels and a large book fair for every type of reader and writer. Under The Gum Tree is excited to announce that our very own Janna Marlies Maron and Robin Martin will be there to talk to anyone willing to listen and answer any questions that may come up. This presents a great opportunity to discuss submission process and the type of work we are looking for. If you are attending, we would love for you to come find us. We can be found sharing a table with Sacramento Poetry Center, publishers of Tule Review, at table number N13 on the Plaza Level of exhibit hall B.
TrueStory is Sacramento's first nonfiction reading series and open mic, featuring real people reading real stories live. The kick-off launch will be at the Crocker Art Museum on Thursday, April 25 at 6:30 p.m. The theme for this event is Remembering 1963 & Civil Rights. The deadline to submit for this event is 3/31/13. The series will have a soft launch on Thursday, February 21 at 8 p.m. There is no theme for the soft launch. We are currently accepting submissions for both the kick-off event and soft launch. Do you have a nonfiction story that is best when read aloud? TrueStory is the place for you. A nonfiction reading series, TrueStory seeks submissions that are no longer than 12 minutes when read aloud. Stories should be personal. You may be relating a story that isn’t necessarily something that happened to you first hand, but you should absolutely tie in your own personal experience to the story. You may want to share about 9/11 even if you weren’t at Ground Zero when it happened — so, how did the event affect you? We are absolutely looking for excellent stories. Beyond that we are looking for excellent readers. Stories will be selected after the curators both read and hear them. TrueStory is a quarterly event, happening in February, April, July and October 2013. The deadline to be considered for February is 2/10/13. Submit your written story here. After we read the submissions, authors of stories that we think might be a good fit may be asked to also submit a video or audio recording. It's 2013. How can we improve this year? At Under The Gum Tree we are always trying to be the best we can. We can't do that without your help though, so we need to know how you think we are doing, and what you think we need to improve. Please send us your opinions by taking our quick and easy survey. To show our appreciation everyone that takes the survey will be given a complementary digital copy of our anniversary issue, and be entered to win a one-year digital subscription to Under The Gum Tree. We can't wait to hear from you! Here's the link to the survey again. Up and Running on LitRagger! The new LitRagger app launched on December 2nd, 2012, but it had our attention weeks before that. "LitRagger gathers the best small press literature has to offer into one convenient space," reads the main page of their website. For weeks we waited with bated breath for Under The Gum Tree to become a part of that great classification, and on the morning of December 17th we were up and running. Founders Adam and Robert proudly shared on twitter that Under The Gum Tree made it in as the first exclusively nonfiction journal, which was exciting news, but we would have been just as happy to have been the hundredth just as long as we were able to be a part of their amazing new community. Check out the app on your iPhone, iPod touch, or iPad and support Under The Gum Tree, LitRagger and other amazing journals, all while relaxing with wonderful new stories.